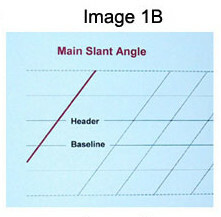 Shaded strokes made by a right-handed person should be made on or closely approximate the main slant angle (see image 1B). 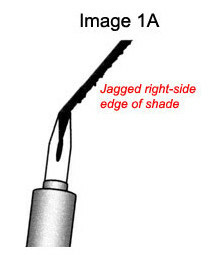 However, if the long axis of the nib is too far off the main slant angle, as shown here and in image 2, the right nib tine could drag across the paper as the stroke is made resulting in the jagged edge showing in image 1A. If you are after such a jagged effect then this is okay; however, if you are after smooth shades as is most common then you will need to make the adjustments described below. Image 2 shows the paper laying with the top edge parallel to my shoulders, straight up and down. Simply grab your oblique penholder and your 'usual and customary' way and lay it on the paper in front of you in your 'usual and customary' position. At this point you should NOT be alter your grip or the lay of your hand. Adjust the paper to fit you. 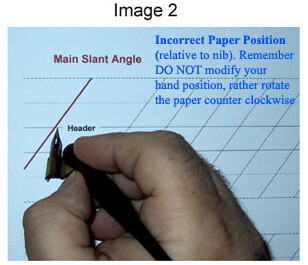 In image 3, I have rotated the paper while keeping my grip and position the same as in image 2. 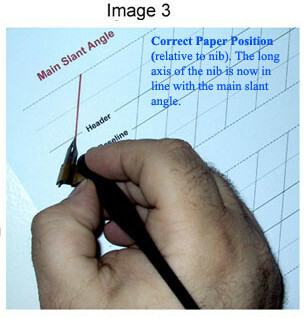 Adjust the paper so the long axis of the nib is on or closely approximates the main slant angle (red line). 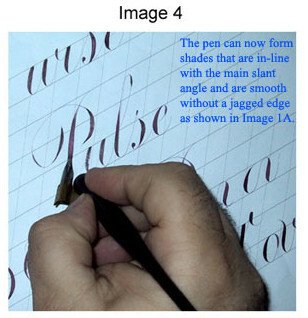 This will guarantee that your shaded down strokes will all be smooth and the overall main slant angle as shown in image 4. Problems occur when a pen artist's normal pen grip sets the pen staff at very different or acute angles versus a normal pen grip. I have seen righties that like to angle the pen staff to the extreme right or in some case the extreme left. This could require rethinking your pen grip. Keep in mind this is my approach but it should server you well as a guideline. The differences in these images clearly show there is hope for anyone willing to put forth the effort to learn script.